DoubleClick - AKA Abusybee: Use Food challenge here at DoubleClick Skittles! Check out the Design Team! Special Guest Designer! Use Food challenge here at DoubleClick Skittles! Check out the Design Team! Special Guest Designer! Welcome to the DoubleClick Skittles Challenge! We are starting a brand new challenge this week! Thank you to everyone that joined in on our Disney challenge! I hope you all enjoyed the new Believe in Magic release! Check out below if you missed the big announcement! Welcome to challenge #28 here at DoubleClick!! Challenge: Use a food project! These are killing me with cuteness! Loving what everyone created!! Those clay pieces your daughter made are FABULOUS!!!!!!! Carri....your cupcake is so stinkin' sweet! Just love it! And your daughter clay pieces are fabulous, she has your talent! Your card is so dynamic and so cute!! What fun to see those clay fruits your daughter has made!! This whole post is yummy and fun and this challenge is going to be a good one!! Hope you have a super yummy, delicious day!!! Megan made total cuteness with that clay! Nice work sweetie! 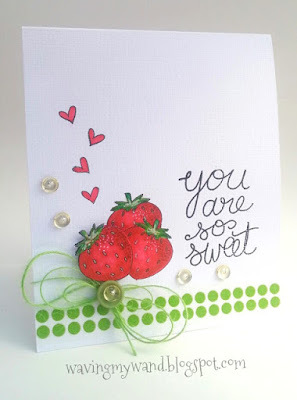 Carri, love your card! That heart on the cupcake? Playing mind tricks with me. At first glance I thought it was glossy. Just adorable with all those super cute elements. You stole my theme for next week though! Haha. 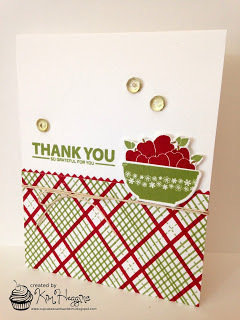 Super fun card!!! Thanks for another fun challenge. I love cupcakes! Adorable creations ladies and your daughters clay fruit is so cute! 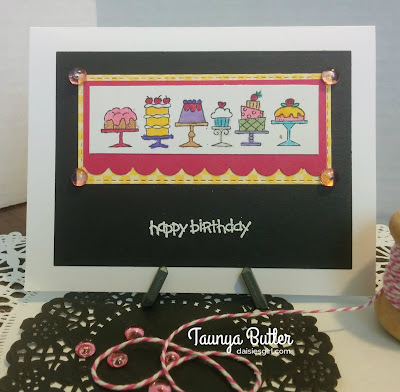 Wonderful cupcake card w/ variety of texture. Like Miss Kate Cuttables. Wonderful DT creations. Especially like your daughter's clay food creations. Great DT cards! Love the clay fruits! Yummy what super cute cupcakes. Great card Carri! I love the yummy cupcake~fun colors, papers and fun twine bow! Love it! Hoe everything is going good for you and the girls are adapting to another school yr. I still can't believe school has started already! Yikes, where did summer go? !